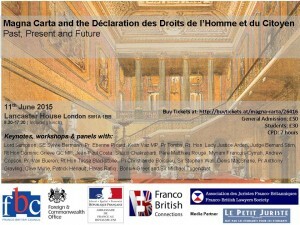 The Franco-British Council, the Franco-British Lawyers’ Society and the Franco-British Connections would like to invite a select number of student to a day seminar on the impact of Magna Carta and the Déclaration des Droits de l’Homme et du Citoyen on our societies through history. The event is to be held on the 11th of June at Lancaster House, a beautiful historical location close to Buckingham Palace. – How have these documents shaped the relationship between those who govern and citizens today? – Should Europe have more or less power over its member states? – Do the domestic political classes need to regain legitimacy? – Do religions have a legitimate right to be exempted from the domain of free speech? – Are the secular settlements of Europe secure? The cost of the one day conference including lunch is £50 or £30 for students. Tickets can be purchased here: http://buytickets.at/magna-carta/26416. Prompt purchased is advised as places are limited. We are also looking for students to act as rapporteurs for the various sessions. If you would like to take advantage of this opportunity, please email us (contact [at] fb-connections.org) to express interest. May 6, 2015 in Events.